I’ve really got addicted to these. Some in progress shots. They are perfect for doing in front of the TV. If only I had time to sit in front of the TV. Or in front of the dvd player on the mac, as I don’t actually have a TV. But I got a little done tonight, watching Season 4 of Six Feet Under. I wasn’t up to much of anything done today because I was working all day – running a workshop at the V&A. We had 80 kids through, and I am pretty worn out. Though I did also do some cooking. Food is my other great love after fabric, so I have started another blog about it here. Like I have time to look after 2 blogs?! I know I am crazy, but I have always talked about writing a cookery book, so this is just the first stage towards it. Anyway, no more food talk here, it’s all OVER THERE. 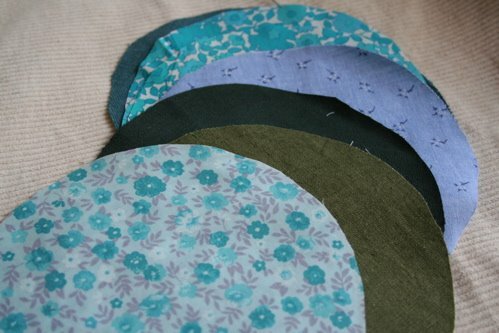 Back to fabric, where this blog belongs. 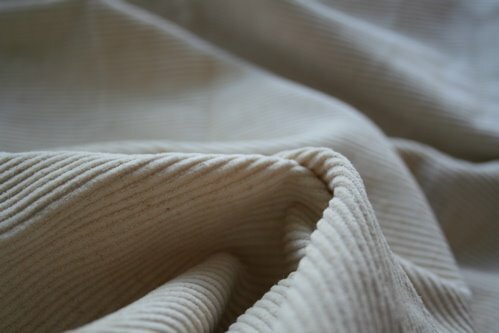 Last week I bought some hemp corduroy, in the first stage towards creating a green range for my collections. Well, greening the stuff that isn’t already made of recycled fabrics! 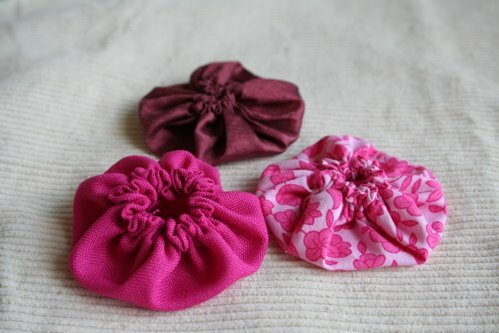 I’m hoping to be able to run a side collection in hemp and organic fabrics, but it all rather depends on whether I can find stuff that I am happy with and can work it into my existing range. I can’t at the moment expand to create a whole new different range! I already have enough… I use needlecord in these cushions, so I am planning to use the hemp cord instead, in some places. I just have the blooming dye problem. Is it better to buy hemp and chemical dye it than use ordinary cord already dyed? Ethical dilemma. I will use unbleached wherever possible, but I am colourful person and my inclination is towards a rich autumnal palette for shows next month and onwards. Hmmm. Difficult. I am waiting for samples from two companies and we will see what it is like. Yes of course it would be great to natural dye the hemp, but I don’t have time or capacity for it, so if I could find someone doing it already, that would of course be the way. Any ideas?? I had a very exciting fabric shop moment today. After the workshop I had to run into town to buy more fabric for tomorrow – those kids just kept coming!- so I decided to treat myself to a tired browse in – absolute fabric heaven. Since I was last there (10 days ago) they have got in a whole range of new silk fabrics – silk jersey, silk lycra and the most amazing thing, real silk tulle!! I thought this wasn’t available anymore! It’s the most delicate lovely stuff. I’ve only ever seen it in vintage / antique clothes. Wow. A bit like 100% silk velvet, which I know is out there, but I have never seen it. An urban fabric myth? I bought 20cms to play with, and will undoubtedly be going back for more. It’s £22/m which I don’t think is bad. Looking forward to trying something with that. For silk velvet, try New York. Saw lovely hot pink silk velvet in a fabric store at 8th Av/ 42nd Street. All stores are more or less nameless, so you’ll just have to wander around.